I DON’T MEAN PITCH your fly box in the bin. 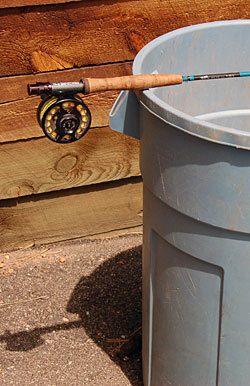 I’m suggesting that, when you practice casting, the garbage can is one of the best training tools you can find. At least it is for the dry-fly trout fisher. Here’s my logic: Many anglers practice casting into hula hoops on “casting ponds” (or in the back yard, the park, etc.). In those cases, you’re either on a platform, or standing with the target below or at your feet. For the person making ready to cast from a flats skiff, that’s great. But in the trout world, you often find yourself standing in a river… sometimes ankle deep, sometimes waist deep. So if you’re six feet tall, your target is often three or four feet below eye level… not five or six feet below. That’s why some of the best saltwater anglers I know — people who can toss perfect, wind-busting loops 80 feet or more — often flail in the kinder, gentler confines of a trout stream when the dry flies are popping. When I’m guiding, one of the most common casting flaws I see is when anglers worry too much about the “back and forth” of a fly cast, and pay no attention whatsoever to the “up and down.” Sure, distance and accuracy are critically important (the opening of a trash can, by the way, is a near-perfect target for simulating a dry fly target zone at 40 feet). But casting is a three-dimensional challenge. You want your cast to unfurl at the desired distance, with the leader and tippet extending fully, then dropping that fly (especially a dry fly) gracefully onto the surface. The drop should be a matter of inches, not feet. When you unfurl a cast too high, there’s a good chance that even a light breeze will blow the fly off course, or else the shock effect of all that energy in the line will cause a recoil, and that leaves unsavory squiggles of leader and tippet in the feeding zone. If you drive the fly too hard to the water (a common result of having practiced with hula hoops at foot level), well, you make a splash commotion that might likewise turn trout off. Guides say, “Imagine the target is really one foot above the water before you cast.” But that’s easier said than done, especially in the heat of the moment. Guides say, “Imagine the target is really one foot above the water before you cast.” But that’s easier said than done, especially in the heat of the moment. You don’t want to be factoring all that stuff when you see a 20-inch brown sucking down PMDs in the film. Instead, you want to practice, practice, practice… to create some muscle memory, and then “will your casts” where you want them to go. As with jazz music, nothing comes easy without practicing the fundamentals. And the more you improvise when you practice — in this case taking an old trash can out of the garage to change the up-down casting plane — the better you’ll “play” live.